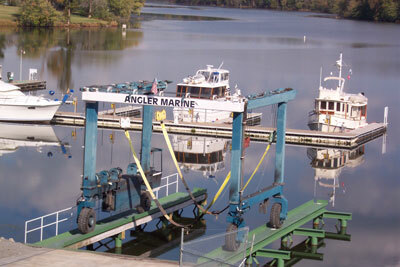 ANGLER MARINE, INC. is a full service marine repair business located at 417 Ed Hembree Drive in Scottsboro, Alabama in the heart of the beautiful Tennessee Valley. Our facility is located ¼ mile off the Tennessee River on Lake Guntersville at mile marker 378.2 (GPS coordinates N-34.34.801, w-86.04.765). Look for the GOOSE POND COLONY MARINA sign. With our 50 ton Marine Travelift and launch piers, we can accommodate the hauling, underwater repairs, and maintenance of larger cruisers, yachts, and houseboats. We maintain a large inventory of quality parts and accessories. Tuesday – Friday 7 a.m. to 4:30 p.m.
Saturday 8 a.m. to 12:00 p.m.